Yet, iPhone was the top seller on Alibaba Singles day? Beating out Huwaei, and Xiaomi. 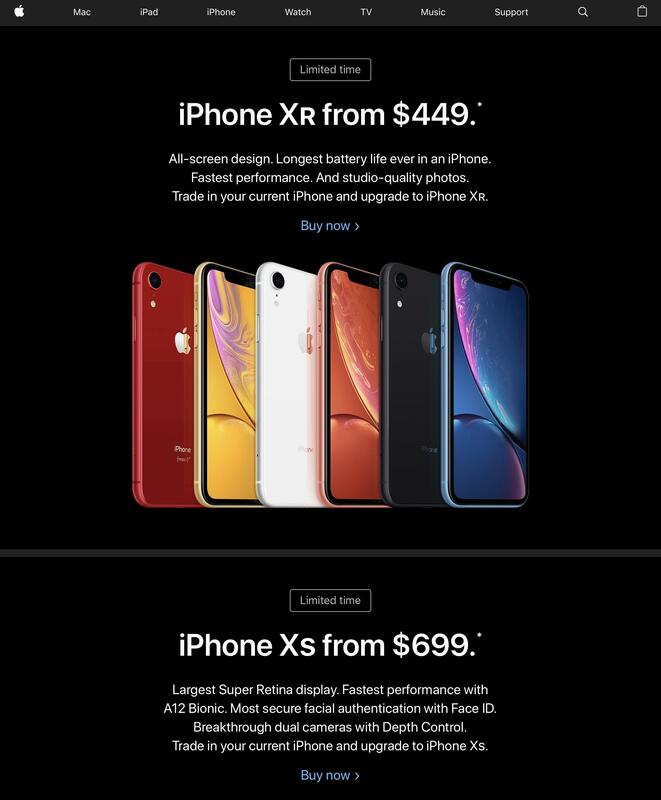 Clearly Apple wants people to see XR $449 and XS $699. And notice the Learn More link was removed and Buy was changed to Buy Now. And I’m seeing on Twitter that owners of older iPhones are getting emails like this from Apple. Does Apple typically send out these kind of emails several months after a phone has been released? And emails where price is the first thing mentioned? I don’t remember seeing things like this last year at all. They are still delusional to think it will be back at 236 within a year I think. and I would disagree that the post above that the markets are usually down this time of year. Quieter and flatter perhaps , but not down as much as they are. That’s due to exceptional circumstances this year and in apples case a series of bad news to go on top. Key question is whether to get back in yet. Gut says it’s gonna go lower (150 easily) before it slowly recovers back to 200 by mid next year. But it I do agree with the analysts that apple has a problem. And cranking up the prices is not going to work in the long run of unit sales keep falling (which they will at the prices they are now charging) . All stocks are priced for future profit, hence why it’s falling. Hiding the unit sales after years of showing them also says you have something to hide. If Apple had a 13 - 18 % discount in any countries I would bet it will win against all of its competitor on that day in sales. Well, I guess now would be a good time for Apple to accelerate its share buybacks. One question for stock experts around here. By buying back it’s shares off the market, doesn’t it also reduce overall AAPL market value? You seem unable to transition with Apple to its hardware / services revenue mix, so you should probably sit out the next three quarters until you get comfortable with this new paradigm. Normally no, because buying up stock will drive the price up. Indeed, Apple seems to have become desperate to sell product very quickly. I think the company is entering its darkest period since the mid-90s. It has to find a viable alternative to the iPhone that provides most of its current income, but that’s a tall maybe impossible order for the near future. 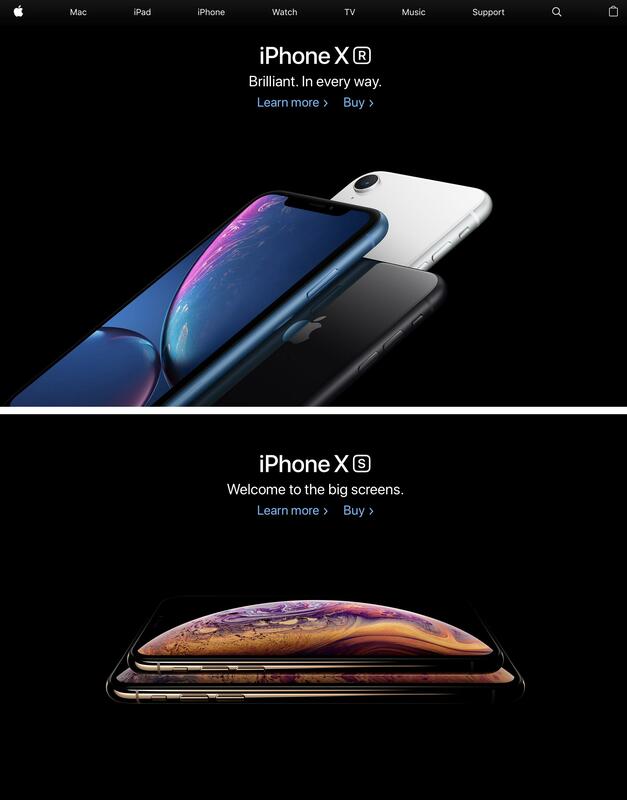 By the time the next gen of iPhones comes around its market capitalization maybe half of what it was just a few weeks ago! This is what happens when your business model still mostly depends on hardware units sold rather than services, which has been the saving grace of companies like Microsoft and Amazon. Apple has been one of the few (and lucky!) companies thus far that has somehow been exempt from this market reality. And while I think they’re aware of this and have been working towards an emphasis on services rather than hardware. They haven’t had enough time yet to achieve it. If they want enough time to achieve that goal, and if things carry on the way they are, they may indeed have to do a Dell and go private. Still, a smartphone purchase cycle of 2 to 3 years is quite decent for any electronic device. I don't think Apple will be hurt by that if it unit sales can be held flat over that period. Apple just needs to look into other revenue streams to make additional cash flow. I'm no financial genius but I think Apple is a long way from going out of business although Wall Street makes it out to be that way. I'll survive if Apple no longer has the highest market cap in the world. I do think Apple may be trying to hide decreasing iPhone unit sales by not reporting those numbers but what else can they do if the well is running dry. It might be a good way to buy time until Apple can figure out some new business strategy. I'm a bit puzzled as to why Apple didn't see this coming years ago and forked away from iPhone dependency. Smartphone market saturation was clearly going to happen with all those cheap Android smartphones being cranked out 24/7/365. Apple will still be the most profitable smartphone maker but it seems that's not important to big investors. If Apple is struggling then how do all those other smartphone makers survive? That's something I can't quite figure out. People above seem to suggest we don’t get the services and wearables drive to more profit. Both need an installed base of users on the iPhone / iPad to keep growing (ie sell more than year before) to keep generating more revenue. Stocks are priced based on future revenue and need to see an ever increasing growth in that aspect where apple is concerned. Atleast that is what the market is expecting. You can say they don’t get it all you want , but as you can see - stock price is massively affected by the perception of others. In short term , not a problem. Apple has a huge installed base (like me) to bend over for more $$ - like they have been recently. The rewards are apparent for doing so too ... record profits. Not rocket science. Plenty of people saw this coming and sold. Saying all that, I’m still confident Apple is a good long term bet and even Jobs once said that “the markets get it ... eventually”. You evidently didn't read the link that I provided, but whatever. As Buffet says: “Be greedy when others are fearful”.